Dose linearity studies on conventional linear accelerators show a linearity error at low monitor units (MUs). The purpose of this study was to establish the dose linearity and MU stability characteristics of a cyberknife (Accuray Inc., USA) stereotactic radiosurgery system. Measurements were done at a depth of 5 cm in a stereotactic dose verification phantom with a source to surface distance of 75 cm in a Generation 4 (G4) type cyberknife system. All the 12 fixed-type collimators starting from 5 to 60 mm were used for the dose linearity study. The dose linearity was examined in small (1-10), medium (15-100) and large (125-1000) MU ranges. 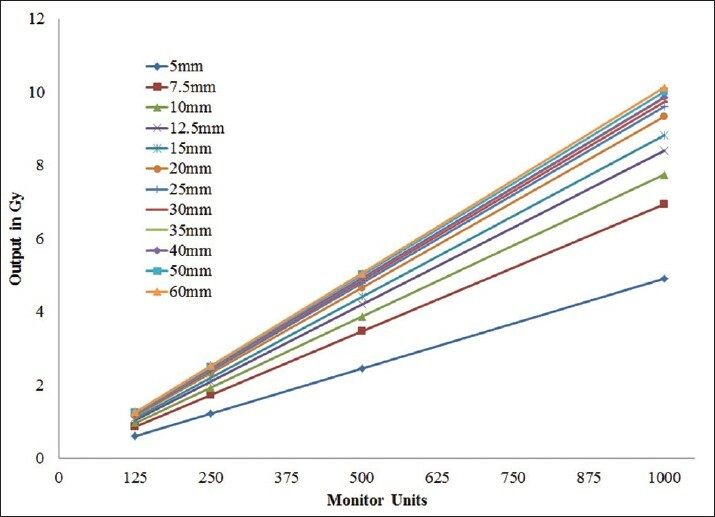 The MU stability test was performed with 60 mm collimator for 10 MU and 20 MU with different combinations. The maximum dose linearity error of −38.8% was observed for 1 MU with 5 mm collimator. Dose linearity error in the small MU range was considerably higher than in the medium and large MU ranges. The maximum error in the medium range was −2.4%. In the large MU range, the linearity error varied between −0.7% and 1.2%. The maximum deviation in the MU stability was −3.03%. 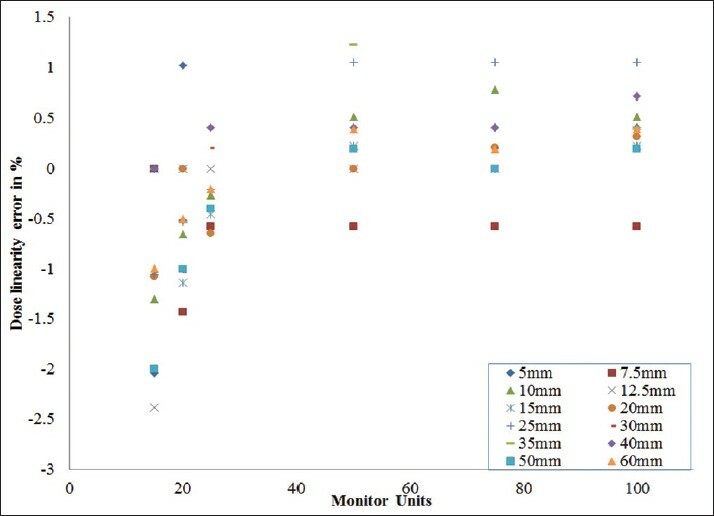 Accuracy of radiation dose delivery is limited by the dose nonlinearity of smaller monitor units (MUs). This is very significant in intensity modulated radiotherapy (IMRT) involving small segment sizes. There are several studies conducted on low MU dose linearity and small field dosimetry for conventional linear accelerators. ,,, Studies by Janhavi R Bhangle et al. suggest that segments with MUs less than 5 MU should be avoided. Dose rate plays an important role in MU dose linearity. Mohr et al. have studied the dose linearity for small MUs for two different field sizes of 10 cm × 10 cm and 20 cm × 20 cm at two different source to skin distances of 100 cm and 95 cm. Reena et al. have found that dose linearity error for MUs less than 5 MU in 300 MU/min dose rate of 6 MV photon beams can go beyond -30%. With very high dose rates of the order of 1000 MU/min, it becomes difficult to deliver MUs less than 10. Cyberknife (Accuray Inc., Sunnyvale, CA, USA) is one among such radiotherapy units having higher dose rates. Cyberkinfe treatment plans involve large number of beams. The MU corresponding to each beam varies from a few MUs to hundreds of MUs. Also, the field sizes which are used in cyberknife treatment are very much smaller than the conventional field sizes used for radiotherapy. Cyberknife commissioning studies by Subhash C. Sharma et al. 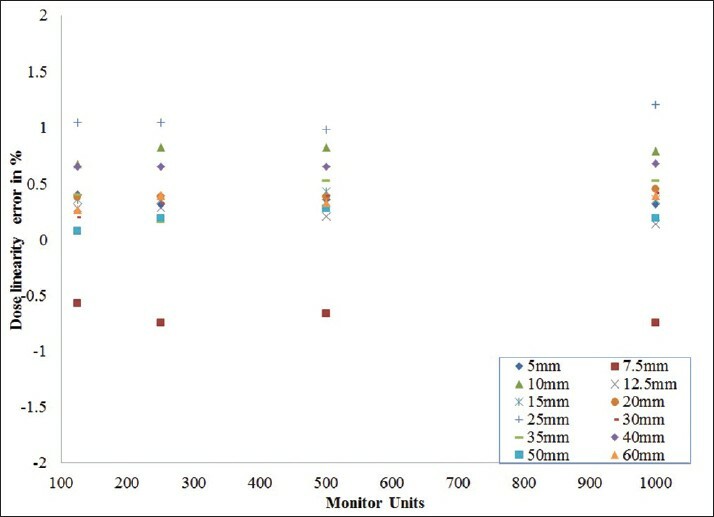 analyzed clinical dosimetry measurements such as tissue-phantom ratios (TPRs), off-center ratios (OCRs), and secondary collimator output factors. However, the dose linearity of cyberknife system was not studied in depth. The purpose of the present study was to evaluate the dose linearity and the MU stability of a cyberknife linear accelerator system for different fixed type collimators. This study was performed on a Generation 4 (G4) type Accuray Cyberknife linear accelerator having 6 MV photon beams with the dose rate of 800 MU/min. A stereotactic dose verification phantom (Standard Imaging Inc., Middleton, WI, USA) was used for measurements. Dimensions of this phantom were 20 cm width, 20 cm breadth and 10 cm height. The ionization chamber was placed at a depth of 5 cm in the phantom. Unidos E electrometer with a 0.016 cc (PTW 31016) pinpoint ionization chamber was used for the quantification of radiation output. The source to surface distance (SSD) was kept as 75 cm. where L = dose per MU, L Ave is the mean dose per MU of the entire MU range (1-1000 MU). The same setup as described above was also used to study MU stability. Stability of MUs was tested for 10 and 20 MU using the 60 mm collimator. For 10 MU, the sets of 1 MU for 10 times, 2 MU for 5 times, 5 MU for 2 times and 10 MU for single time were used. Similarly, for 20 MU, the sets of 1 MU for 20 times, 10 MU for 2 times, 5 MU for 4 times and 20 MU for single time were used. The single time exposures of 10 MU and 20 MU were taken as references in the respective cases. Percentage of deviation from the reference accumulated total dose was reported. 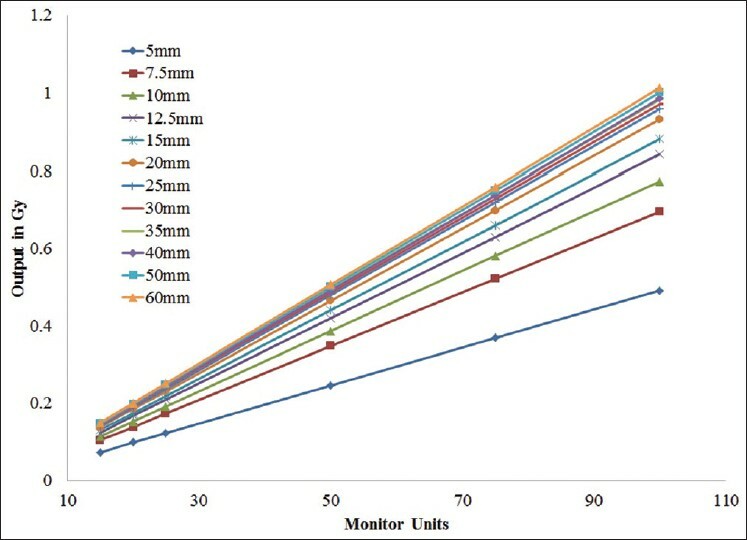 The dose linearity graphs between the MUs and the dose output for all MU ranges for all the collimators are shown in [Figure 1],[Figure 2],[Figure 3]. The linearity error of −38.8% was the highest for 5 mm collimator when 1 MU was delivered. This was the maximum linearity error value in the overall range of 1-1000 MU for all the collimators. The maximum linearity error for all the collimators in all the ranges of MU is tabulated in [Table 1]. In the small MU range, the linearity error varied between −38.8% and 1.3%. In this range, the linearity errors were found to be higher for 1 and 2 MU for all the collimators. 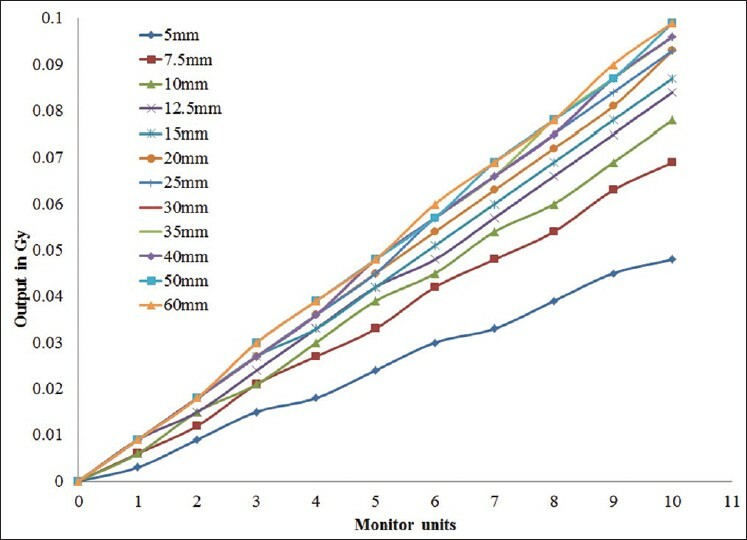 For 5 mm, 7.5 mm and 10 mm collimators, the linearity error was found to be very high when compared with the other collimators. Linearity error variation with collimator size in the small MU range is shown in [Figure 4]. For collimators with sizes more than 12.5 mm, the linearity error was less than 11% in this range of 1-10 MUs. In the medium MU range, almost all the collimators showed a better linearity than in the small MU range. The highest error observed in this range was −2.4% and it was for 15 MU. For all other MUs, these values were less than or equal to ±2%. Dose linearity error varied between −2.4% and 1.1% for all the collimators in the medium MU range. Linearity error variation with collimator size in the medium MU range is shown in [Figure 5]. Linearity error variation with collimator size in the large MU range is shown in [Figure 6]. Dose linearity in this large MU region was the best among all the three MU ranges. The highest linearity error in this range was 1.1%. This linearity error varied between −0.7% and 1.2% for all the collimators in the large MU range. MU stability showed better results with 60 mm collimator, with the maximum deviations around −3% with respect to the single time exposures. In the 10 MU set, the single time exposure of 10 MU was taken as the reference. The deviation in accumulated reading for 5 MU measured two times was 0%. At the same time, it was −3.03% for 2 MU measured five times and 1 MU measured ten times. Similarly in the 20 MU set analysis, a deviation of −1.49% was observed for both 10 MU measured two times and 5 MU measured four times with respect to the single time exposure of 20 MU. When 1 MU measured twenty times a deviation of −2.99% was observed. Delivery of small MUs through a small field size with a higher dose rate may lead to inaccuracy in the delivered dose. Especially in IMRT, dose linearity, MU stability, stability of flatness and symmetry are of importance while delivering small segments. ,,, The inaccuracy in small MU delivery arises due to the delay in the dose rate buildup. Usually, the IMRT doses are delivered with a dose rate in the range of 300-500 cGy/MU. But the stereotactic doses with cyberknife are delivered with dose rates as high as 800 cGy/MU. Cyberknife plans often contain beams of fewer MUs less than 10 MU. Also, the cyberknife fields are very small and the maximum is 60 mm. Thus, it is inevitable to establish the dose linearity and MU stability of the cyberknife beams. From this study it is observed that the dose is linear with MU in the medium and large MU ranges (15-1000 MU) for all the 12 collimators. However, considerable linearity error is observed in the small MU range. Dose linearity studies on a linear accelerator by Reena et al. show −32% error for a dose rate of 300 cGy/MU when 1 MU is delivered. Similar effect was observed in the present study. Dose linearity error of −38.8% was observed for 5 mm collimator and −10.9% for 60 mm collimator when 1 MU was delivered. In G4 type cyberknife, the MU can be set in integers only. It is notable that if the MU setting uses an integer, then MU = 1 implies a probability of 50% error in the MU value itself due to rounding off. Dose nonlinearity in the small MU range may be because of the choice of detector. The sensitive volume of the pinpoint chamber PTW 31016 (0.016 cc) has a radius of 1.45 mm and a length of 2.9 mm. This should be adequate for measuring the dose linearity with 5 mm collimator. However, studies by Pantelis et al. suggest that pinpoint ion chamber underestimates for smaller collimators and gel dosimetry is the detector of choice for them. In their study on cyberknife output factors, they noticed that pinpoint chamber can underestimate the dose up to 10% for 5 mm collimator. Probably, this could be the reason for dose nonlinearity in the small MU region. The dependence of detector can be reduced by using a glass rod detector [10,11] or gel dosimeter  or radiochromic films.­  The present study can be extended further for detector dependence on dose linearity. MU stability studies by Bhangle et al. show a variation of 13.29% for 15 times 1 MU (15 MU accumulated). Similarly, studies by Reena et al. show a variation of 2.6% for 50 times 2 MU (100 MU accumulated). It is observed in the present study that the deviations are higher for lower MU combinations and lower for higher MU combinations. MU stability study on cyberknife shows a maximum −3.03% for 2 MU five times and 1 MU ten times (10 MU accumulated). Stereotactic fields of cyberknife robotic radiosurgery system show good dose linearity fit for all the collimators in the medium and the large MU range. But they show the linearity error in the small MU range, especially below 3 MU, as in the case of conventional linear accelerators with the big reference field size of 10 cm × 10 cm at the source to axis distance. Dependence of pinpoint ionization chamber detector on dose nonlinearity in the small MU range should be confirmed before choosing the cut-off MU for clinical applications. As far as MU stability is concerned, better stability is observed with higher MU combinations than with lower MU combinations involving MUs less than 3 MU. 1. Bayouth JE, Morrill SM. MLC dosimetric characteristics for small field and IMRT applications. Med Phys 2003;30:2545-52. 2. Aspradakis MM, Lambert GD, Steele A. Elements of commissioning step-and-shoot IMRT: Delivery equipment and planning system issues posed by small segment dimensions and small monitor units. Med Dosim 2005;30:233-42. 3. Saw CB, Li S, Ayyangar KM, Yoe-Sein M, Pillai S, Enke CA, et al. Dose linearity and uniformity of a linear accelerator designed for implementation of multileaf collimation system-based intensity modulated radiation therapy. Med Phys 2003;30:2253-6. 4. Ravikumar M, Al Asmary MA, Alla A Sultan R, Al Ghamdi HA. 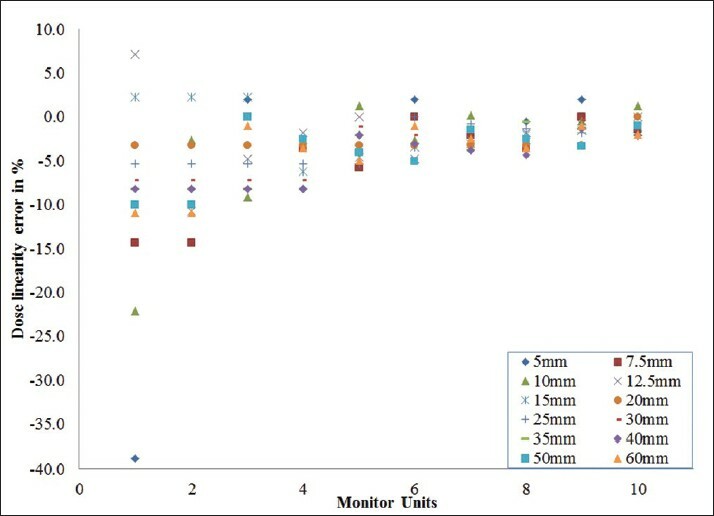 Dose delivery accuracy of therapeutic photon and electron beams at low monitor unit settings. Strahlenther Onkol 2005;181:796-9. 5. Bhangle JR, Sathiya Narayanan VK, Deshpande SA. Dose linearity and uniformity of Siemens ONCOR impression plus linear accelerator designed for step-and-shoot intensity-modulated radiation therapy. J Med Phys 2007;32:103-7. 6. Mohr P, Brieger S, Stahl J, Witucki G. Linearity of the dose monitor system at low monitor units. Strahlenther Onkol 2007;183:327-31. 8. Sharma SC, Ott JT, Williams JB, Dickow D. Commissioning and acceptance testing of a Cyberknife linear accelerator. J Appl Clin Med Phys 2007;8:2473. 9. Pantelis E, Antypas C, Petrokokkinos L, Karaiskos P, Papagiannis P, Kozicki M, et al. Dosimetric characterization of CyberKnife radiosurgical photon beams using polymer gels. Med Phys 2008;35:2312-20. 10. Perks J, Gao M, Smith V, Skubic S, Goetsch S. Glass rod detectors for small field, stereotactic radiosurgery dosimetric audit. Med Phys 2005;32:726-32. 11. Rah JE, Shin DO, Jang JS, Kim MC, Yoon SC, Suh TS. Application of a glass rod detector for the output factor measurement in the CyberKnife. Appl Radiat Isot 2008;66:1980-5. 12. Wilcox EE, Daskalov GM. Evaluation of GAFCHROMIC EBT film for Cyberknife dosimetry. Med Phys 2007;34:1967-74. Sudahar, H., Kurup, P.G.G., Murali, V., Velmurugan, J.